The detained union chairmen allegedly released on Fayose’s order are Ekundayo Ajibaye of the National Association of Academic Technologists (NAAT), Mutiu Ademola of the Senior Staff Association of Nigerian Universities (SSANU) and Adebayo Dada of the Non-Academic Staff Union (NASU). Addressing a press conference in Ado-Ekiti yesterday, Soremekun accused Fayose of exerting pressure on him while serving as the Chief Returning Officer for the Edo State governorship election by sending one of his (Fayose’s) aides to him (Soremekun). He claimed that Fayose had allegedly been after his life after serving as the Chief Returning Officer in Edo Governorship Election held last year September 28, where Governor Godwin Obaseki had defeated the candidate of the PDP, Osagie Ize-Iyamu. 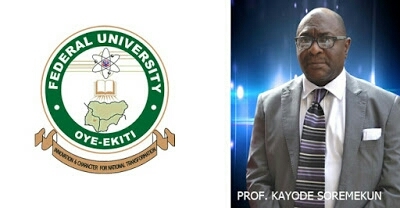 Soremekun revealed that during the convocation week of the university held late April, Fayose who was passing through Oye-Ekiti stopped his convoy and personally participated in the destruction of the huge banner hung at the university junction in the town. He said: “He (Fayose) ordered his convoy to stop and tore the banner of our convocation. He said it was not properly done, he alighted himself and tore it by himself before proceeding on his journey.” “The unionists were becoming so unruly in recent time. In fact, they beat up some lecturers and we called for their arrest only for the Secretary to the State Government(SSG) to bail them out acting on governor’s directive. Reacting through his Special Assistant on Public Communications, Lere Olayinka, Fayose said he has no business with the university. 0 Comment to "Gov.Fayose Is After My Life, Federal Varsity VC Cries Out"